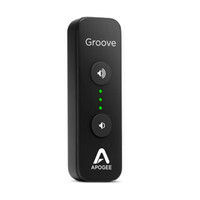 The Apogee Groove is the best portable USB DAC and headphone amp for listening to music on your Mac or PC. Groove takes the same high quality audio technology found in the worlds most prestigious recording studios and delivers it to your laptop. Connect Groove directly to your computer and connect your headphones or powered speakers directly to Groove. Its that easy. Youll be amazed by the difference in sound quality. This entry was posted in Apogee and tagged Recording-and-Computers. Bookmark the permalink.